very long (I am not a quick card maker). I supported him in every way I could. But after all, I am a card maker and if I don’t make cards for the most important people in my life, what is the point of making cards at all??? This card couldn’t possibly be simpler so I have very few comments on it. First, this is two stamps, just so you know. I lined up the horizon line on my second image with the grid line on my block so I would know where to stamp so they would connect, these being rubber, not clear polymer. Second, I love watercolouring and I used watercolour paper because the washes warp normal paper. Third, this card is an unusual size. 6×3 3/4” I think. Last, I used markers to enhance the tree and tufts of grass, so much easier than trying to use a fine brush and watercolour paint. Mixed Media YEAH!! Paper: watercolour paper by Strathmore, ruby red and not quite navy CS-SU! Accessories: waterolour crayons, watercolour brush, markers-all SU! Sorry to hear about your husbands gma. 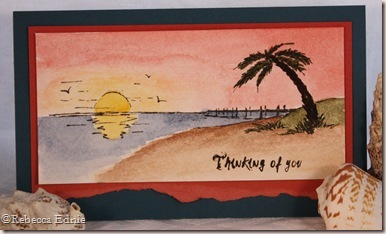 Surely this card will cheer him up, its really pretty!